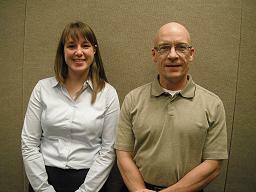 Bright Lights welcomed Laura Knaus and Brad Penner to its Board of Directors at the November meeting. Knaus and Penner have diverse skill sets that bring additional depth to the Bright Lights board. Knaus began her career as a teacher in inner-city Chicago and is currently the principal at Sacred Heart Catholic School. Penner started his career in news media and is now public relations counsel at Snitily Carr, a local full-service advertising agency. The executive committee for 2013 was also named: Jody Olsson, President; Cathy Hedstrom, Vice-President; Brian Runge, Treasurer; Monica Henkenius, Secretary; Chris Whitehead, Past President. The board is currently engaged in the organization's third strategic plan as they continue to guide Bright Lights through another year of making unique summer educational opportunities available to Lincoln youth. The classes are intended to promote lifelong learning and expose students to topics and career paths that fall outside of traditional school curriculum. For a complete listing of the Bright Lights Board of Directors, click here.